You are Loved – Thank you! Sometimes designer series paper and stamp sets match eachother so nicely, that you can’t help but use them together. Ever since I got the Comfort Cafe designer series paper, I have been wanting to use it with the You are Loved stamp set since they complement eachother perfectly! I saw this idea on Linda Arhus’ blog (she has great ideas!) and had to make one myself. I definitely need to invest in some new cutting pads for my big shot as they are warped in such a way that my dot embossing didn’t come out too great, but you get the idea… I also had to use contraband (sorta) product to get the circle layering to work. 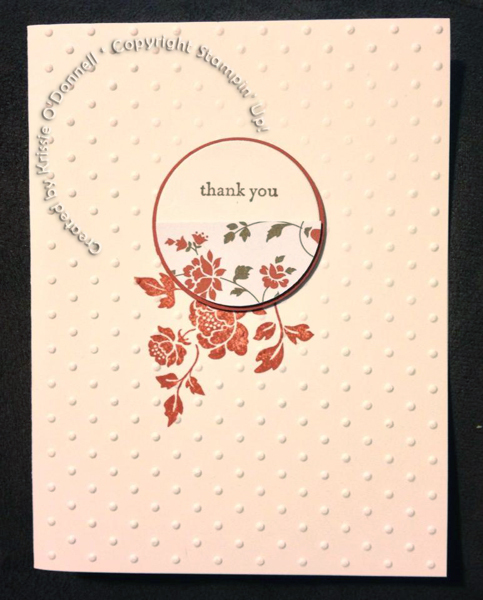 I used Sizzix circle framelits. Which we sell, just not in the circle shape… hopefully eventually we will!